The U.S. is sanctioning two senior Turkish officials over the ongoing detention of an American pastor, whose case has ripped open the deep divides in the two countries’ alliance. The White House announced Wednesday that Turkey‘s Interior Minister and Justice Minister would be hit with sanctions after repeated attempts by the Trump administration to negotiate for Andrew Brunson’s release and threats from President Donald Trump himself that Turkey would be penalized if he weren’t. Sanctioning senior members of an ally’s government is a rare move that will escalate the standoff over Brunson’s case and likely infuriate Turkey’s government. But it comes as Turkey, furious with the U.S. over a host of other issues, has increasingly distanced itself from its NATO ally the United States in a slow shift that could have dramatic implications for the region. 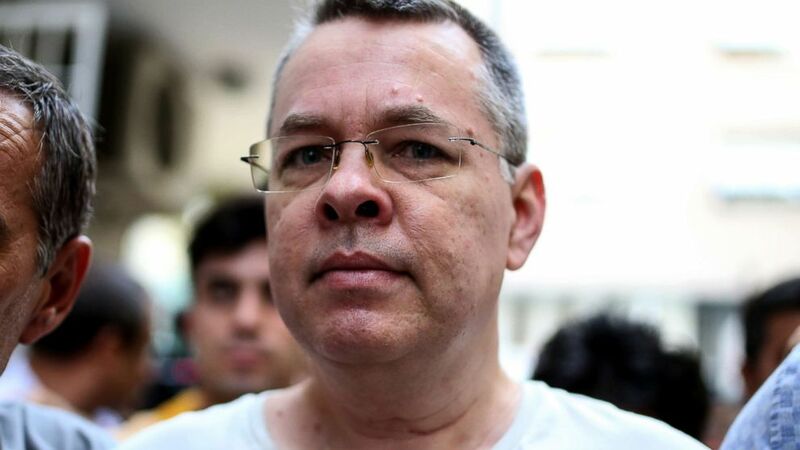 A 50-year old Christian pastor from North Carolina who’s lived in Turkey for over two decades, Brunson was detained in October 2016 amid a sweeping crackdown on opposition by Turkish President Recep Tayyip Erdogan following an attempted coup. He was charged with espionage as well as aiding outlawed Kurdish militants and a Turkish cleric based in the U.S. who has been accused of fomenting that coup attempt — allegations that he has denied and that the U.S. has said are not credible. 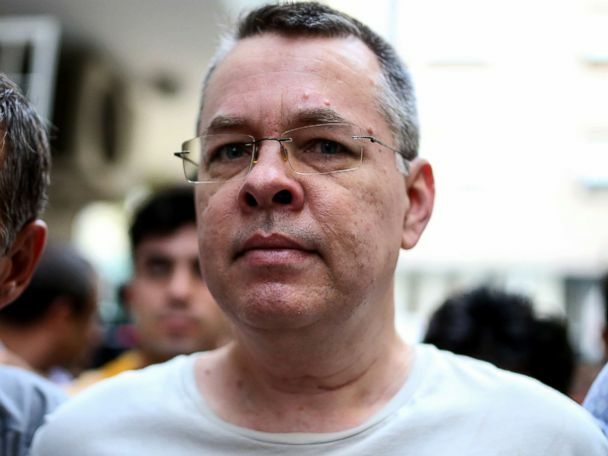 President Trump even warned in a tweet that there would be “large sanctions on Turkey” if Brunson, “this innocent man of faith,” wasn’t freed immediately. 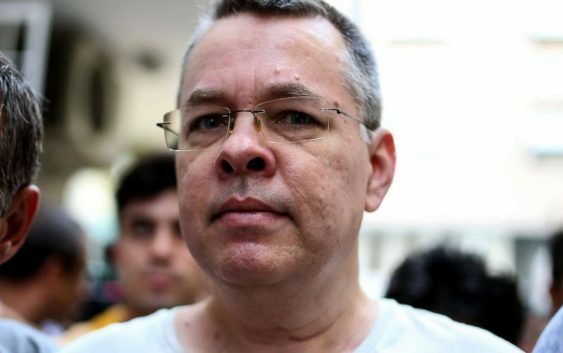 “We’ve seen no evidence that Pastor Brunson has done anything wrong, and we believe he is a victim of unfair and unjust attention by the government of Turkey,” Sanders added. Secretary of State Mike Pompeo called his counterpart, Foreign Minister Çavusoglu, Wednesday morning to inform him of the decision. “After numerous conversations between President Trump and President Erdogan and my conversations with Foreign Minister Çavusoglu, President Trump concluded that these sanctions are the appropriate action,” he said in a statement. With the sanctions, any assets owned by either official in U.S. jurisdiction will be frozen and Americans will be barred from doing business with them. It’s unclear how big an impact that will have on them individually, with Justice Minister Gül tweeting that he has no money, not even a dime outside Turkey. After Trump’s threat of sanctions last week, Erdogan warned that Turkey will challenge the U.S. if there are continued threats: “We will not step back when faced with sanctions. They should not forget that they will lose a sincere partner,” he said, according to Turkish media. 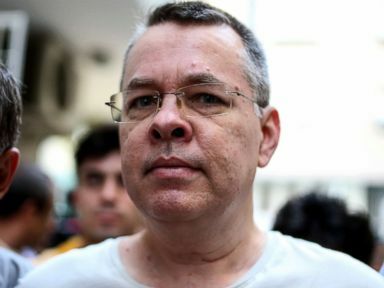 Before Wednesday’s announcement, a bipartisan group of senators had introduced legislation to withhold international loans to Turkey until it releases Brunson and other U.S. citizens being detained. Congress also just passed a sweeping defense bill that in part blocks the transfer of F-35 fighter jets to Turkey until the Pentagon completes an assessment of U.S.-Turkish relations. The last time Turkey was hit with U.S. sanctions may be as far back as the 1970’s when Congress imposed an arms embargo on Turkey and Cyprus over the Turkish invasion. Brunson’s case has been tied to Gulen as well by Erdogan, who once suggested a “swap” — something the U.S. dismissed. It’s hard to overstate the importance Turkey places on Gulen. Turkey’s final Prime Minister Binali Yildirim likened his living in the U.S. to a country harboring the masterminds of the 9/11 terror attacks during a visit to Washington last November — a betrayal that has sparked outrage. Erdogan has blasted the trial as a “plot” to overthrow his government, even though the country’s prime minister at the time Ahmet Davutoglu admitted in December 2017 that they did not comply with U.S. sanctions: “We have never been hypocritical when it comes to the embargo against Iran. We have never complied with the U.S.’s one-sided embargo. We can not,” according to multiple press reports. The State Department has dismissed the allegation of a U.S.-backed coup as “ridiculous” —- and in turn, criticized Turkey for its detention of American citizens as well. In addition to Brunson, as many as a dozen Americans, many of whom are dual citizens of Turkey, have been detained in Erdogan’s sweeping purge. For its part, the U.S. wants Turkey to cut back on its ties with Iran and Russia, including abandoning the purchase of S-400 anti-aircraft missile system from Russia — which could violate U.S. sanctions on Russia and would violate NATO’s requirements that all member states use weapons systems that are interoperable. If either side is concerned about the growing rift, they have not shown it. The Trump administration has engaged in intensive diplomacy with the Turks to assuage concerns about the Kurds, for example, but Wednesday’s sanctions heighten the tensions.